Young drivers are being steered in the right direction to be aware of cyclists and motorbikes on the roads. Cyclist and motorcyclists are among the most vulnerable road users in the UK. More than a third of people killed or seriously injuries don our roads are those on two wheels and 100 riders are injured every day. Bike Smart is the theme of the Brake Road Safety Week from 19 November to 25 November. The Brigade is teaming up with Cleveland and Durham Police Specialist Operations, the North East Ambulance Service and council road safety officers to visit the colleges in Hartlepool, Middlesbrough, Stockton, and Redcar. The students will be trying out new Virtual Reality technology goggles to see at first-hand the horrific consequences of a road traffic incident and volunteer as casualties to be extracted from vehicles by firefighters. Staff will be using the “close pass mat” which illustrate drivers must leave at least 1.5m (5ft) when passing a cyclist. Andrew Bright, Lean and Live Coordinator, Cleveland Fire Brigade, said “The dark winter months provide additional risks for cyclists and motorcyclists and we are advising drivers how to be Bike Smart by not taking risks and remembering to Look Out for Each Other. “Riders can also play an important part by having the right safety gear and also ensure that they are clearly visible in all conditions. Other road users should take care and be extra vigilant respecting their fellow road user. “It should be remembered that the person put at risk through lack of care will be someone’s son, daughter, mother, father, brother, sister or mate”. 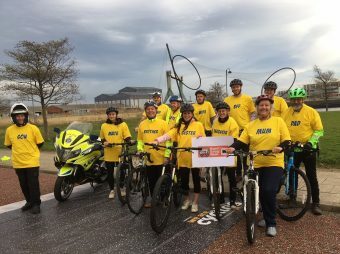 Zoe Lewis, Principal and Chief Executive, Middlesbrough College, said: “As a college who actively encourages physical activity and environmental choices, we are delighted to be involved and support road safety projects like this to raise awareness and promote safe travel. Take time to look properly before you pull out at junctions – a second look could save a life!